I started this blog in late 2006, so it’s almost 7 years old now. That’s a long time, particularly online where time seems to pass like dog years. Having studied my posts during the first few years in particular, i noticed they lacked depth and seemed almost alien to me, in 2013. I don’t like removing content just because it’s become irrelevant or dated with time, but that’s what i’ve done. For example, i blogged in-depth about several projects, many of which were sold / flopped and because they’re now just landing pages or under new ownership, the stuff i was writing about becomes kinda pointless and would just end up confusing a new reader who’s coming to the blog for the first time. My earlier posts also tended to be a lot shorter than my posts these days, plus they didn’t contain the big ‘feature’ graphics at the start. Since 2010, i’ve been designing a graphic for every single blog post i make. It serves multiple purposes, one of which is to ensure i take time to think & perfect the content before publishing it. Reading through my earlier posts, i may have been publishing more, but the quality definitely wasn’t there. In tandem with deleting over 500 posts, i decided to move the site to a new host and generally try to optimise it by cleaning up the database, ditching unused plugins… that sort of thing. A few months ago, i came across a lot of talk about digitalocean and how they were disrupting web hosting and making cloud hosting affordable for the hobbyist… if not more affordable than run of the mill shared hosting. For $5/month, you get your own VPS with 512mb RAM and 20GB SSD. However, that’s not why i like digitalocean (although that’s a big reason)… what sold me was the sheer volume of tutorials and support they have on offer. They’ve built a community where people are encouraged to ask questions and get answers… FAQ’s are made in to articles and published by staff… so if you’re a complete newbie to setting up a VPS, you’ll more than likely find articles or questions on whatever problem you’re running in to. I’ve learned a great deal about how to optimise a server for wordpress and how to host multiple domains on the same server etc… all thanks to the digitalocean community. I may actually do a few indepth tutorials myself as i’m aware how daunting a prospect it can be when moving from the safety of a shared host to a VPS and working with command line stuff. Out of the box, you’ll more than likely struggle to host multiple domains on the same server plus if you opt for the 512MB RAM, i’d be confident you’ll end up using more resources than you have and wordpress will actually crash. But with some tweaks, you can fix all of that stuff. 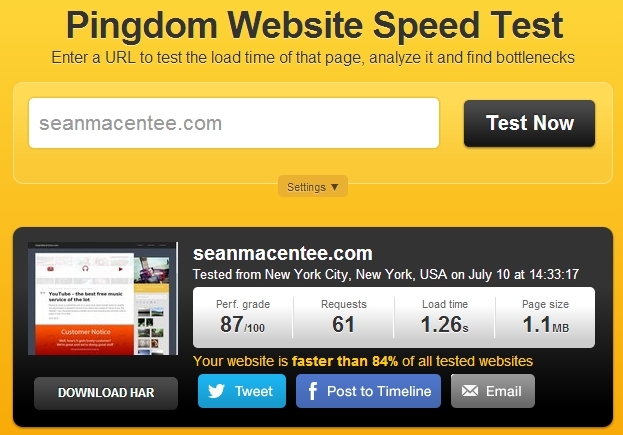 The net result is that this site is now running faster than ever before. The ‘proof’ for me is in the back end, where there’s a noticeable improvement in the time it takes for pages to load. I also use cloudflare so most of the time, the stuff you (the end user) sees will be cached anyway and should be relatively quick to load.